- The DVD's we purchase come complete with Case, Cover art, and full feature length movie. - Interactive Menus and Chapter Selections a 1972 Television Trailer a 1986 Theatrical Trailer a 1946 Radio Plug/Jukebox featuring Johnny Mercer a Bonus Hidden Easter Egg cartoon "Coal Black and de Sebben Dwarfs"
- Region One. North American Format. After the Civil War, down in the south, a boy named Johnny (Bobby Driscoll) is excited about a trip to visit his grandparents. However, his visit soon turns painful as he learns that his parents are separating, and his dad returns to Atlanta. Determined to run away, he starts off for Atlanta with all his possessions in a bag. As he starts leaving the plantation, he hears Uncle Remus (James Baskett) telling a group of people stories about Brer Rabbit. He stops to listen, and people start looking for him. Uncle Remus reassures them he knows where the boy is. Then he befriends Johnny and thru his Brer Rabbit stories convinces him to stay at home. Johnny befriends a little girl named Ginny. She gives him a puppy, and her older brothers want to drown it. Uncle Remus once again saves the day with his stories. Johnny's mother gets angry because Uncle Remus kept the dog, so she demands he not tell any more stories. Uncle Remus, unhappy about the way he's being treated, leaves for Atlanta. Johnny chases him and is injured by a bull. 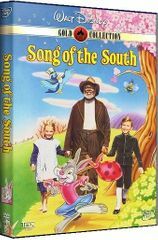 Although he almost dies, one of Uncle Remus' stories pulls him through. We appreciate your taking the time to visit our web site and look forward to serving you.